On March 23, we sent a legal petition to EPA requesting the Agency revoke or amend its rules governing Aquifer Exemptions. The year and a half long effort, spearheaded by NRDC, is an escalation in the fight to protect all underground sources of drinking water from oil and gas industry pollution. Last year we released a first ever report exposing the practice of lifting federal protections on potential sources of drinking water. These underground sources of drinking water are protected at the federal level by the Safe Drinking Water Act’s Underground Injection Control program. However, there is a little known provision that allows certain oil, gas and mining activity to occur in groundwater that would otherwise be protected as a drinking water source. This is an Aquifer Exemption. Oil and gas companies use Aquifer Exemptions for two primary purposes: to inject wastewater underground for disposal, or to inject water, steam and other fluids for enhanced oil recovery (ER). We believe the fundamental premise of the Aquifer Exemption program – that oil and gas activities are take priority over groundwater protection – begs for rigorous oversight. Unfortunately, what we found was quite the opposite – that regulators are sacrificing aquifers without much scrutiny. The current criteria to exempt an aquifer was written over 30 years ago and does not reflect the modern threats to drinking water, changes in demand for groundwater, impacts of climate change on water resources and improvements in water treatment technology. 18% do not even contain the exact location of the aquifer exempted. See more stats on Aquifer Exemptions. No Aquifer Exemption has ever been rescinded and restoring an aquifer after millions of gallons of oil and gas waste, or fluids used for production, are injected into it is highly unlikely. The legal petition has real consequences in the near term. Currently there are dozens of Aquifer Exemptions pending approval in California – where local residents are resisting any attempts by the oil and gas industry to lift federal protection of their groundwater and legally pollute future sources of drinking water. These residents are right to question EPA’s ability to safely oversee the Aquifer Exemption approval process. Bottom line: Almost half the country relies on groundwater for its primary drinking water supply. Sacrificing any potential drinking water source should be subject to the highest scrutiny. Yet EPA’s current aquifer exemption program demonstrates this is not the case. 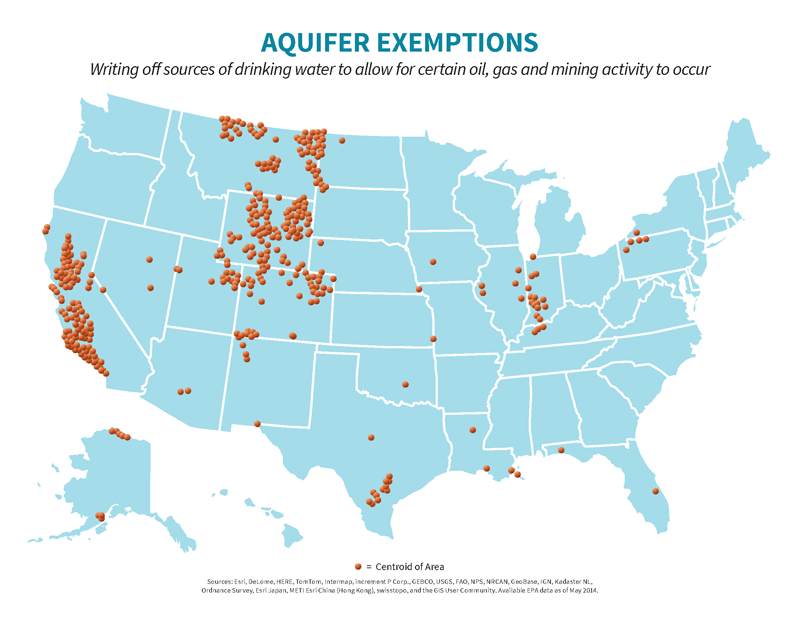 Instead of prioritizing fossil fuel production, EPA needs to put drinking water first and revisiting the Aquifer Exemptions rules is a necessary first step.